Now -May 7 Viewing Stones Exhibit: Legacy of Japanese Suiseki in North America, National Arboretum, D.C.
May 12-14 Potomac Bonsai Spring Bonsai Festival and World Bonsai Day Celebration, National Arboretum, D.C.
May 27– June 4 Exhibit: Satsuki Azalea Bonsai, National Arboretum, D.C.
Frank Mihalic of Wildwood Gardens visited for a “bring your own tree” workshop. Members were impressed by how decisive he was and how quickly he worked. I think that we were also impressed by his unique eye and design suggestions. Memorial Service for Dan Kalman. 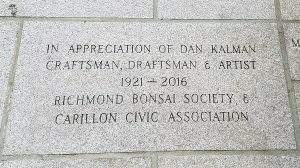 On Monday, June 10, RBS Members and Carillon Civic Association members regathered at the entrance to the Maymont Learning Center where we fondly reminisced about Dan. It was very nice and we want to thank Jack for organizing the memorial stone and the service and also thank everyone who contributed to pay for the stone. Dan’s stone is at the bottom of the steps, on the left as you approach the main entrance of the Center. RBS Member Study Group, Saturday, April 15, 10:00 am – 4:00 pm, St. Mary Woods Community Room. RBS members are invited to come and work together on their own trees. This will be an informal event. Members may come and go as pleased. They should bring their own trees to work on, but can also just come watch. In addition, they should bring their own tools, equipment, and cleaning supplies as needed. Sometimes, we finish early, so if you are coming after noon, it may be a good idea to call or email Thomas just to make sure we are still there. Regular April Meeting: Slab Planting Workshop, Monday, April 24, 7 pm. We have been planning this workshop for some time. Last summer, RBS members got together to make concrete slabs specifically for this workshop. Before the meeting, you should probably brush up on slab and landscape plantings from our May 2016 Newsletter, from a book, or the many online websites and videos available. To complete a slab planting, in addition to normal tools, you will need 3 things: a slab, plants, and all of the other stuff like muck, soil, and other supplies, each discussed below. For slabs, you can bring the concrete one you made last summer. purchase one made particularly for bonsai, or make use on innovative materials like pieces of flat stone, slate tiles, wood, or even plastic cutting boards. Often, the planting is mossed over the edge and you don’t even see the slab itself. Whatever you use, it should be flat(ish), which is the point of a slab planting, and sturdy enough to hold trees and soil. Think bigger that the trees themselves. If you don’t have or can’t find something, the club has about 10 extra pieces from last summer that are available for $10-25, depending on size, or bring a very flat pot or large plastic cutting board. Below are photos of the concrete ones we made, a ceramic one made specifically for bonsai, and a slice of petrified wood sold as a cutting board. Members can bring their own plant materials, including trees, accent plants, and live moss. 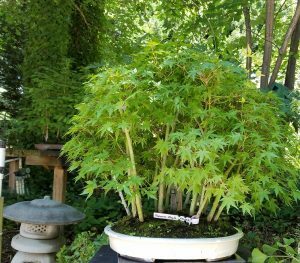 We will have for purchase a selection of Morris Dwarf boxwood and red Japanese maple seedlings in a variety of sizes. 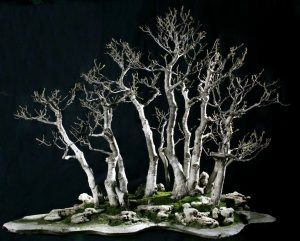 You could also bring something from home or head to a nursery and find something, like the small trees they sell for miniature landscapes. In addition, you should being your own accent plants like mondo-grass or hostas, and live (green) moss, and small stones if you wish to use them. Now that you have a slab and trees, RBS will take care of the rest. RBS will supply “slab kits” the muck mix, bonsai soil, wire, and epoxy as needed for either $5 or $10, depending on the amount that you need for your slab. This meeting will be held in the Community Room at St. Mary’s Woods, 1257 Marywood Ln., Richmond VA, 23229. As always, members are invited to come early if they has questions or need advice on their trees. 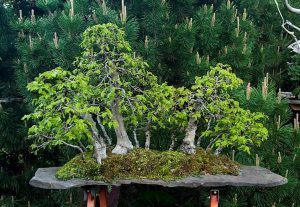 World Bonsai Day Festival, May 12, 13 & 14, 10:00 am – 5:00 pm, National Bonsai & Penjing Museum, Washington, D.C. Join us for our annual bonsai festival which features something for everyone. Activities include workshops, demonstrations, special exhibits, and vendors. 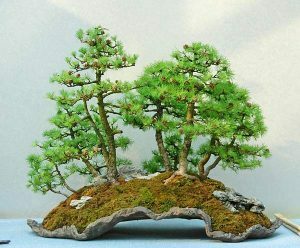 The festival celebrates World Bonsai Day, an annual event founded on Saburo Kato’s belief that bonsai has the power to unite people by acting as a bridge to international friendship and peace. 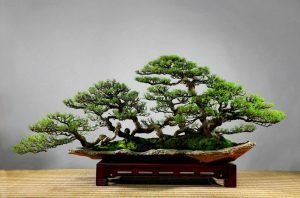 This event features a curator-led museum tours, demonstrations, workshops, vendors, and an exhibit about Mr. Kato, founder of the World Bonsai Friendship Federation. 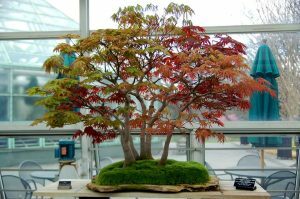 World Bonsai Day Festival is co-sponsored by the National Arboretum, the National Bonsai Foundation, and the Potomac bonsai Association. 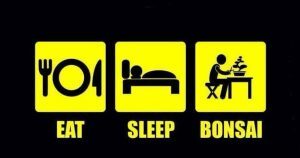 For a complete schedule of activities, see the Bonsai Festival Schedule. Free, except for workshops, which are $55. Registration required for workshops. 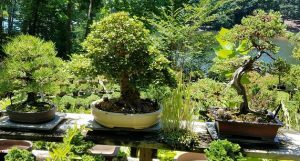 The last instillation of my road trip as I headed back to Richmond was a visit to The Bonsai Learning Center in Mooresville, North Carolina, just north of Charlotte. 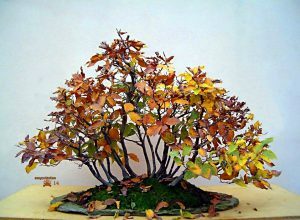 The center offers a wide variety of bonsai materials, supplies, and has regular workshops. The Center is located at the hillside home of one of the owners with trees spread around the house, under the shade and in the open back yard. There is a nice workshop space and merchandise room built into the basement of the home, which opens up to the patio, back yard, and a beautiful lake view. 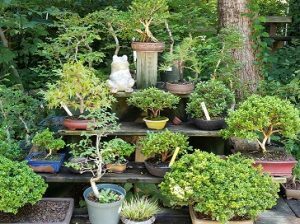 They have a nice supply of pots, including some unique ones, tools, soils, and other typical bonsai stuff. I made an appointment by phone the day before and arrived late morning. While the owners were working in the back, poked around leisurely for about an hour; then we had a nice chat, I asked questions, and we discussed workshop possibilities for the club. They were generally really nice. 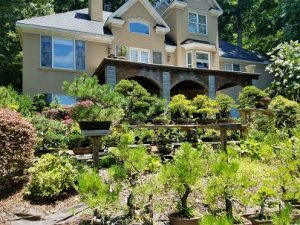 They have a large selection of conifers, mostly pines and junipers, but also a lot of shade trees including boxwoods, elms, maples, hornbeams, azaleas, and other typical trees that are very typical for our climate, which was nice. Their trees vary from some nursery stock, lots of beginner or slightly styled trees, and even some specimen trees. They even had a nice selection of lace stone, and claim that it is less expensive than at one of the other places that I visited during this trip… I wish I had know then. 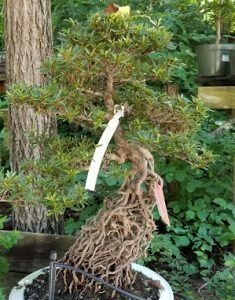 The Bonsai Learning Center has a lot of nice stuff, however, I did feel that their material was a bit expensive, and since this was the end of my trip, I really only had room and cash for one more tree, this nice boxwood (below). 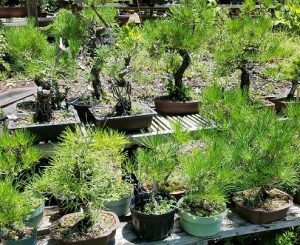 All in all, I would say that The Bonsai Learning Center would be a great day trip for a workshop or a shopping trip, but definitely stop in if you are passing through the area.